The National Institute of Justice (NIJ) Forensic Technology Center of Excellence (FTCoE) is committed to improving the practice and strengthening the impact of forensic science through rigorous technology corroboration, evaluation, and adoption; effective knowledge transfer and education; and comprehensive dissemination of best practices and guidelines to agencies dedicated to combating crime. The Forensic Technology Center of Excellence (FTCoE), led by RTI International, is supported through a Cooperative Agreement from the National Institute of Justice (NIJ), Office of Justice Programs, U.S. Department of Justice (awards 2016-MU-BX-K110 and 2011-DN-BX-K564). NIJ is the research, development and evaluation agency of the U.S. Department of Justice. The FTCoE supports the implementation of new forensic technology and best practices by end users and is dedicated to elevating the status of forensic science through advancing technology, sharing knowledge, and addressing challenges. The FTCoE bridges the gap between the scientific and the justice communities. The FTCoE evaluates innovative research and technology and assists in the transition of tools into practice. The FTCoE provides objective and reliable information to the forensic science community in the form of reports, webinars, podcasts, social media, and the www.forensicCOE.org website. The FTCoE convenes forensic science stakeholders to develop solutions to complex problems in the community. This project was supported by Award No. 2016-MU-BX-K110, awarded by the National Institute of Justice, Office of Justice Programs, U.S. Department of Justice. The opinions, findings, and conclusions or recommendations expressed in this publication/program/exhibition are those of the author(s) and do not necessarily reflect those of the Department of Justice. NIJ — the research, development and evaluation agency of the U.S. Department of Justice — is dedicated to improving knowledge and understanding of crime and justice issues through science. NIJ provides objective an​d independent knowledge and tools to inform the decision-making of the criminal justice community to reduce crime and advance justice, particularly at the state and local levels. – Research can make a difference in individual lives, in the safety of communities and in creating a more effective and fair justice system. – Government-funded research must adhere to processes of fair and open competition guided by rigorous peer review. – NIJ’s research agenda must respond to the real world needs of victims, communities and criminal justice professionals. – NIJ must encourage and support innovative and rigorous research methods that can provide answers to basic research questions as well as practical, applied solutions to crime. – Partnerships with other agencies and organizations, public and private, are essential to NIJ’s success. RTI International is an independent, nonprofit institute that provides research, development, and technical services to government and commercial clients worldwide. Our mission is to improve the human condition by turning knowledge into practice. 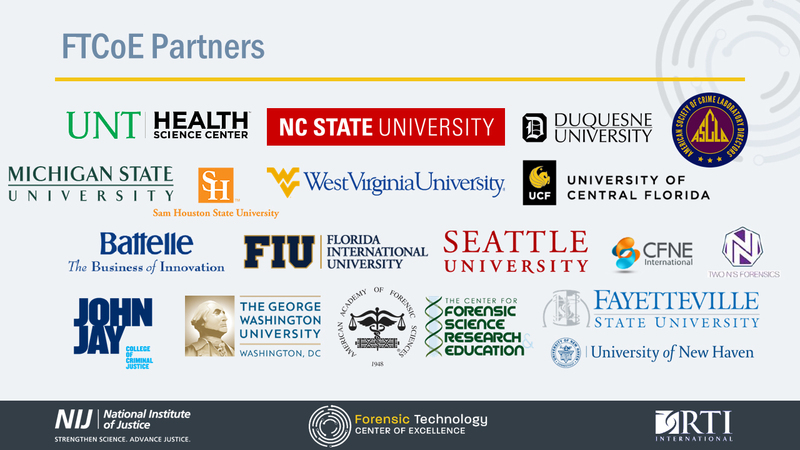 Together, the FTCoE partners encompass all of the forensic disciplines, providing to the FTCoE unparalleled experience, knowledge, resources, and expertise vital to the advancement of forensic science. Our academic partners are educational institutions accredited through the Forensic Science Education Programs Accreditation Commission and have a proven history of providing state-of-the-art education and research contributing to the forensic sciences. Our industry partners utilize a combination of science and advanced, novel technology to resolve criminal casework, further catalyzing the adoption of new methodologies and technologies into the field of forensic science. Want to Partner with the FTCoE? Submit a Partnership Proposal.